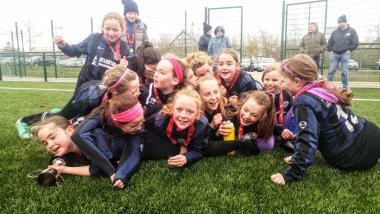 Despite battling tough opposition and strong winds it turned out to be a bright weekend for many club teams, none more so than the U12B girls (pictured) who won 2-1 away to Knocknacarra B on Sunday morning to complete the league and cup double for this season. Persistence and good teamwork helped Lauren Morgan register two cracking goals while dominant displays by both Katelyn Walsh and Katie Murray in midfield helped Craughwell control the game against strong opponents. Well done to coaches Liam Walsh and Martina Morgan and all the girls on a wonderful season. On Saturday afternoon, the U12 boys reached the Connacht Shield Final after a memorable 3-0 victory over Kilglass FC in windy Enniscrone. Craughwell were served well by Oisin Bergin between the posts who pulled off an important save just before the break. The win was secured following three second half goals from Dara Zimmerer, Cian Connaughton and Louis Keary. United were marshalled well by the ever present Keary who was supported by his two flying wing men Alex Ryan and Cian Connaughton. Both Paddy Malone and Dara Zimmerer worked tirelessly and transitioned the play well from defence to attack especially against the wind in the opening half. Midfield generals Eoghan Mulleady and Jack Murray dominated a competitive midfield with the skilful Colm Doyle holding the line up front. Conor Morgan, Jamie Noone and Jason Greaney also made notable contributions. The Connacht final will be an all Galway affair against Knocknacarra in the near future. Also on Saturday, the junior men’s side were promoted from Division Three after a 4-0 home win over Corofin at Coleman Park. Declan Burke’s side were pinned back in the first half by a spirited away side but with the wind helping Craughwell after the break the important first goal was not long coming. A swift move between Alan Callanan and Jack Lally allowed Darragh Minogue to finish well and ten minutes later, central defender Alan Tormey capped a ‘man of the match’ performance with a well taken strike from outside the box. Prolific striker Callanan soon added his fourteenth and final goal of the season before Jack Lally scored a direct free kick to round off an outstanding season for the midfielder. On Sunday, the U16 boys maintained their promotion push with a resounding 7-0 home win over Cregmore/Claregalway B. Ross Whelton notched a fine hatrick with further goals from Lewis Ryan, Jack Regan, Tomas Barlow and Jack Farrell. Earlier, the U14 girls were defeated 6-1 at home to a well drilled Corofin team.